Two Full Days of TSD Rallying completed. 20 TSD Stages. Total accumulated penalty time is 02:04 (two minutes, four seconds)… we’ll find out in the morning where that lands us in the class and overall standings. Dad & I feel this is our best outing since the 2004 Forza Amelia. 2011 Monte Shelton NW Classic Rally, part one. Dad & I are running the 2011 NW Classic again this year, after missing it last year. My folks drove over to central Oregon from Colorado earlier in the week, and yesterday Dad & I drove over the mountains to Portland for scrutineering and check-in. 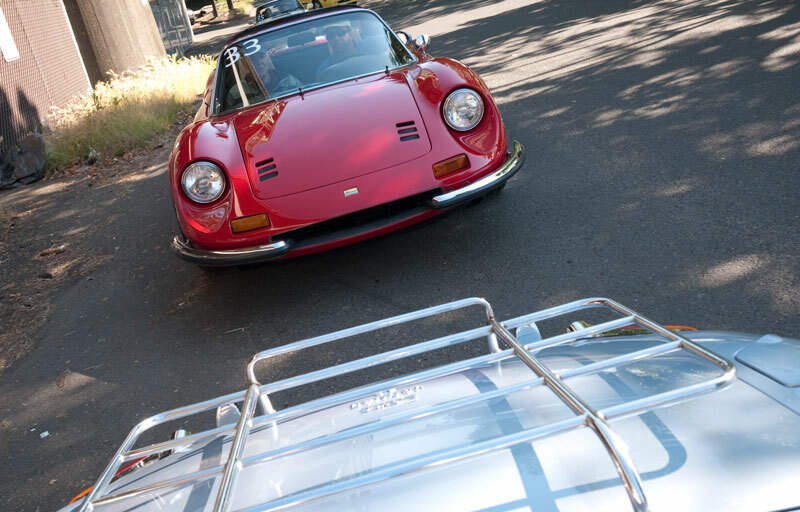 This morning the rally departed downtown Portland and wandered south, eventually arriving at Salishan, south of Lincoln City on the coast. Nine Regularity, and One Monte Carlo Segment (with two Regularities NOT SCORED due to road conditions. In a field of 62 cars total that places us 4th overall. 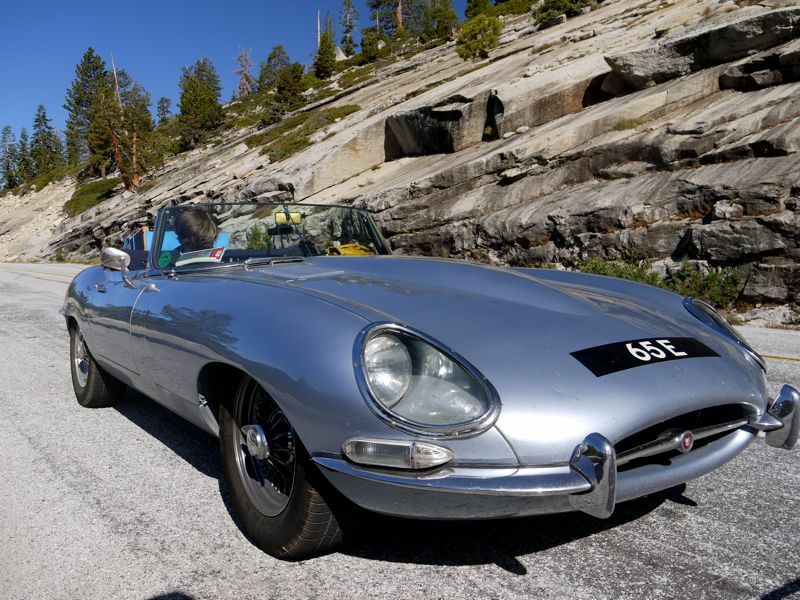 Author chuck goolsbeePosted on July 28, 2011 Categories Cars1 Comment on Substitute Car. First there’s Rallying, then there’s Road Trippin’. After my rallies are done I like to top off the season with a road trip and I have a duesie for you this year. Stay tuned! A really odd car I ran into in a parking lot outside of a big Concours. Do you recognize it? 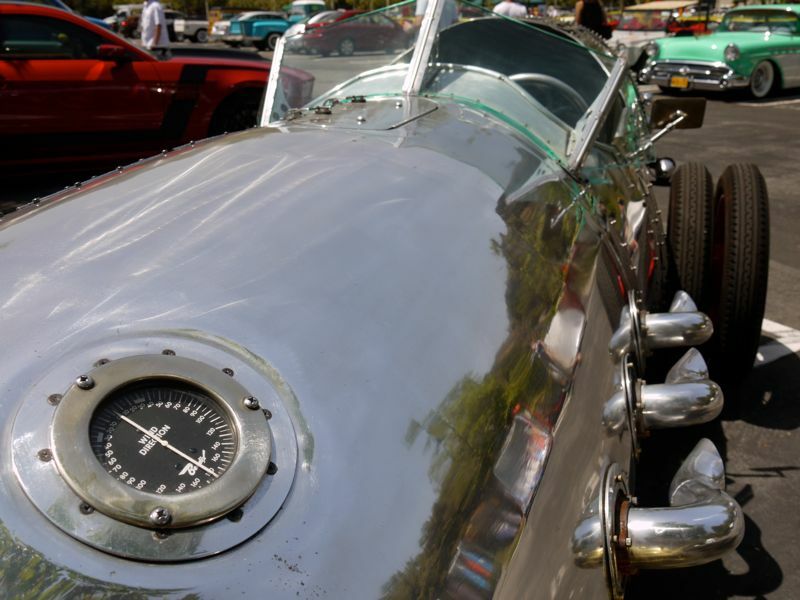 When I was a kid my father drove MG’s. 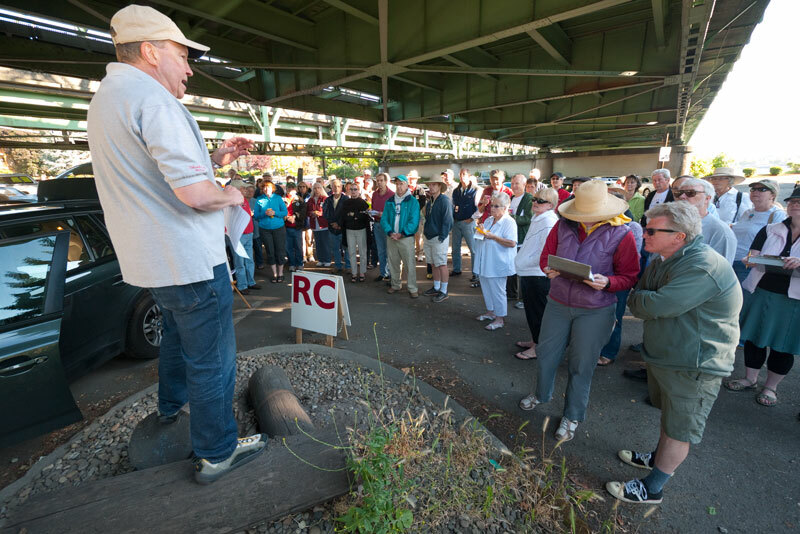 I can recall an MG Club Newsletter that spoke of Rallymasters living under a bridge, much like a troll. 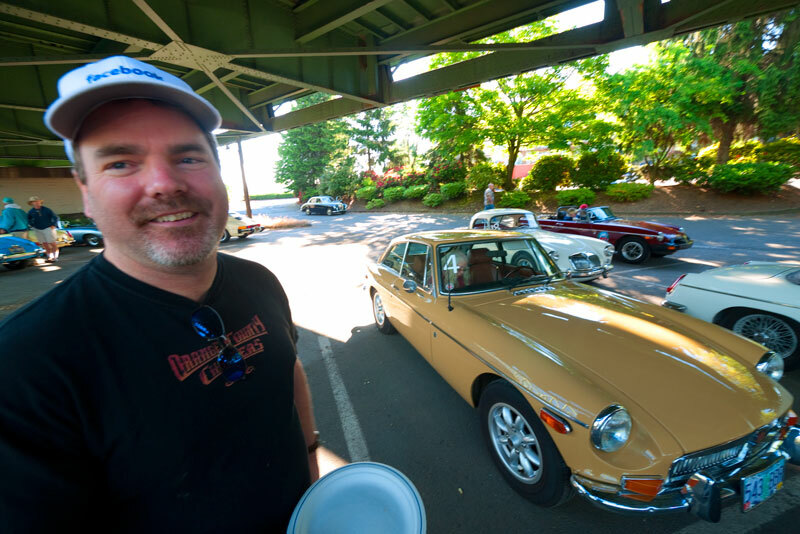 So here forty years later we started an MG Club Rally underneath a bridge – the Interstate 5 bridges over the Columbia River to be exact. 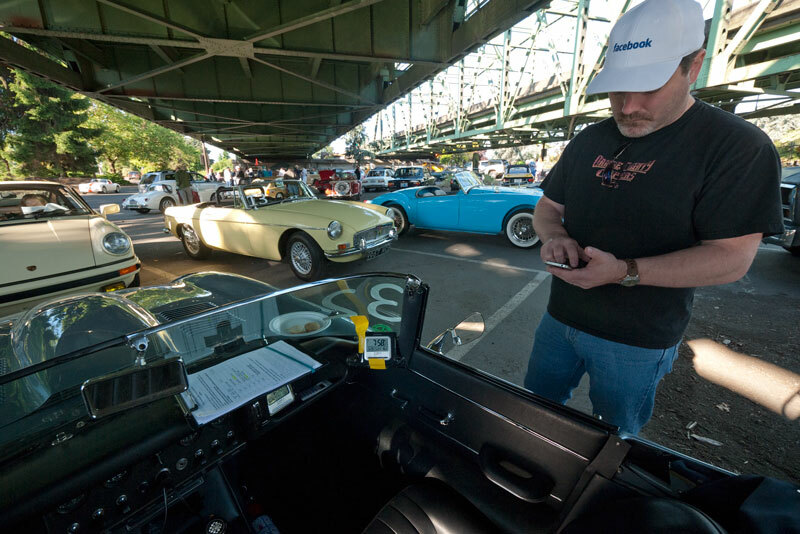 We came to Portland to participate in the 2011 Columbia Gorge Classic Rally, hosted by the Columbia Gorge MG A Car Club. 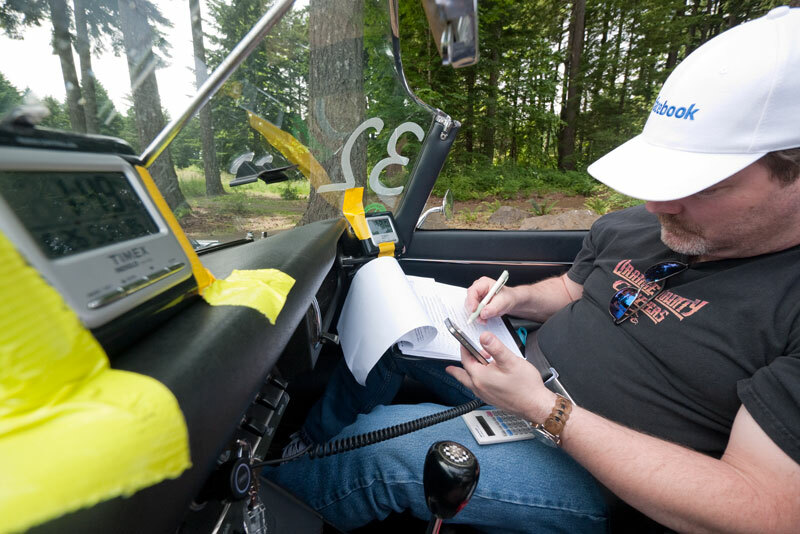 For me it was a warm up rally for the Monte Shelton NW Classic later in the summer, but for my navigator Kyle Murray, it was his very first outing in a TSD rally. I’ve known Kyle for seven years, as we’ve worked together – both at digital.forest and now Facebook. He was very excited to finally be rallying – or at least not yet had his enthusiasm ripped out of him by a devious rallymaster. We collected our continental breakfast and perused the machines arranged beneath the roar of Sunday morning traffic over the bridge suspended above our heads. We’re car number 32, so after the instructions are passed out Kyle gets to work and I pull out my camera and walk around shooting the rally cars lining up to start. I wander back to the 65E and we queue up for the start. 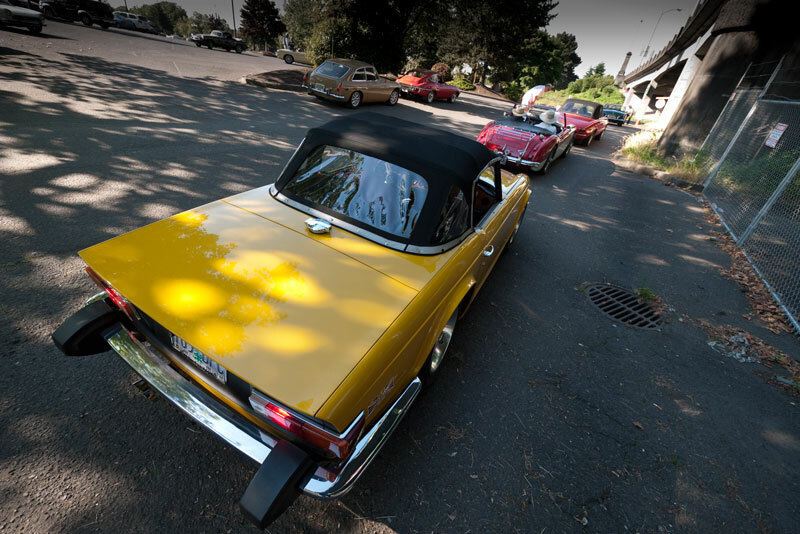 We’re a minute behind a black MG A and a minute ahead of a very nice ’74 246 Dino Spyder. I’ve seen this car before at the Monte Shelton NW Classic. Very nice. 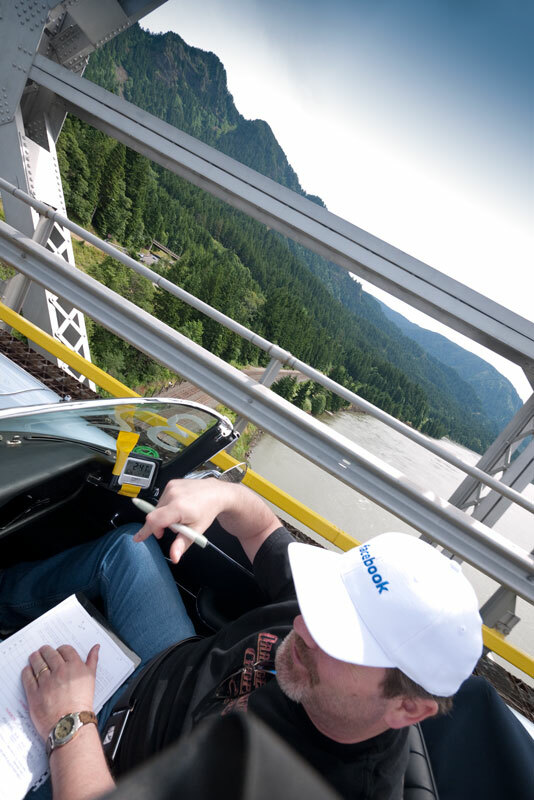 The odometer calibration stage takes us north across the Columbia on I-5, to a rest area, where we wait for the start of TSD Regularity & Monte Carlo stages. Kyle is totally into it and does a damn fine job in the segments before lunch. We nail a 00:00 on our first segment (anytime a Novice navigator gets a zero is a major achievement in my book! Well done Kyle!) followed by a 00:01, and 00:03, then 00:17, and a 00:12. We didn’t know we had only a cumulative 32 seconds of penalty at Lunchtime, but we did feel pretty damn good while we ate our burger at Battle Ground State Park. It really threw Kyle for a loop, so I started doing navigation with him on the fly. We were hopelessly off-time, so our goal was just to stay on-course and make up time as much as possible. Kyle fed me route instructions and I navigated the traps (which were almost everywhere!) and drove like a madman to catch up. We missed a few turns, but mostly stayed on-course, occasionally seeing a lost rally car going the wrong(?) way, also at speed. We finally found the checkpoint (03:28 off time!) and continued driving like mad to make up time lost in future segments! We also blew the next segment’s checkpoint, and caught up to start time (just) by the start next segment. Later we learned that the rally master threw out the two segments after the particularly tough one because so many cars had missed their start times. Oh well! 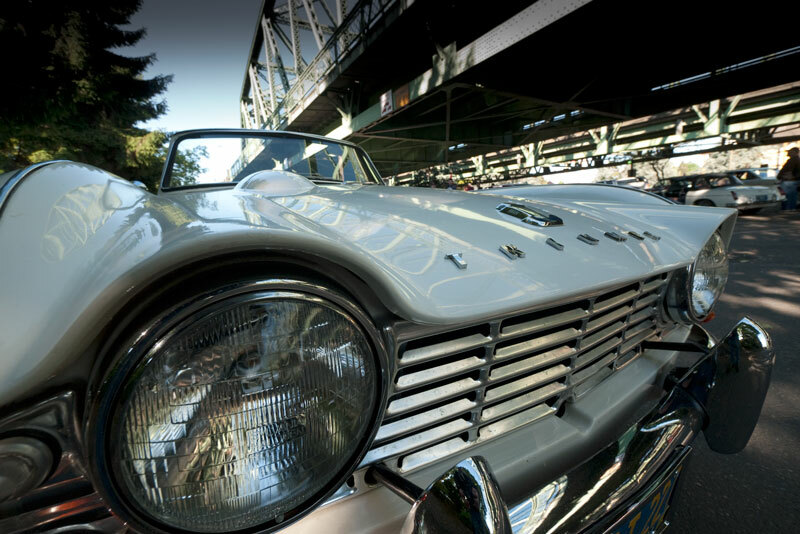 The fourth segment after lunch was a Monte Carlo that started at a state park in the Columbia Gorge just off SR14. I’m able to teach Kyle a lesson in Monte Carlo style rallying: Forget the average speed; go fast, get ahead, and find a stand-off. We launch off and head east on SR14 towards The Bridge of the Gods, where we were to cross the other Bridge of the Gods. The latter has a lattice steel deck, which you can look right through as you drive across, something that amused Kyle to no end. 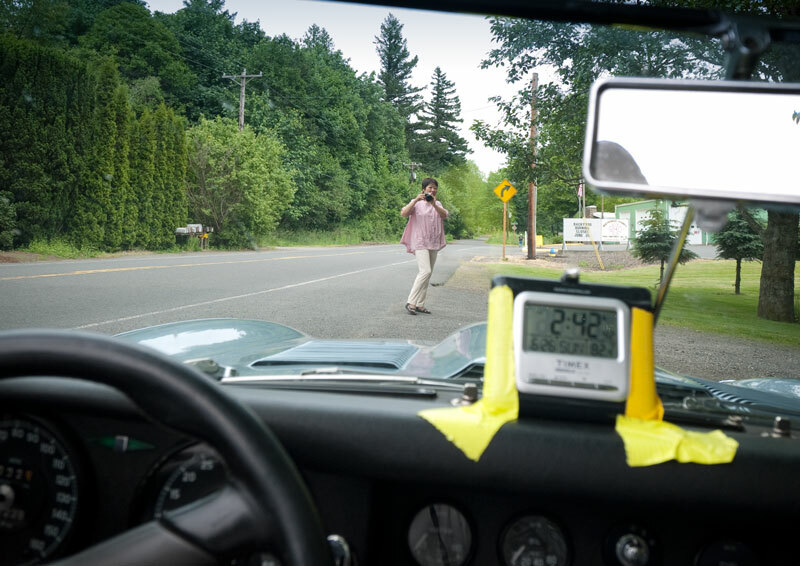 Kyle comes back and announces that he can not see the checkpoint, but can see the road where it likely is, so we roll forward until we can see the likely stop-sign that is where the checkpoint is located and await our time to go. We see almost no other rally cars, which is disturbing, but we’re confident that we’re in the right spot. I chose when to depart, and once rolling feel that I’ve gone too soon. Always easier to move fast to hit a time than to slowly crawl to it. I’m forced to crawl and sure enough arrive three seconds early. Grrr. 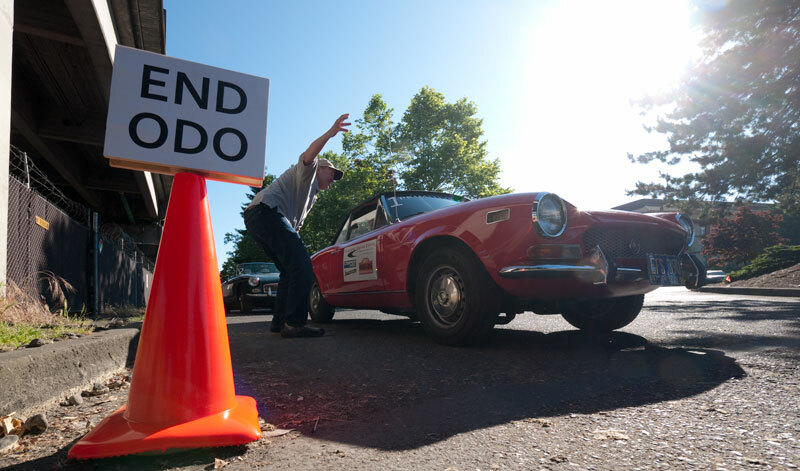 The final TSD Regularity is quite tough, and traps us in a wrong turn. I recover and drive too fast, thinking that the checkpoint is much farther ahead than it turns out to be. We arrive way too early (and unbeknownst to us at the time, capture the maximum 5 minute penalty,) which is all MY fault. I apologize to Kyle, fully admitting that my error has likely blown that segment. He’s cool with it all though as he’s had a ton of fun. 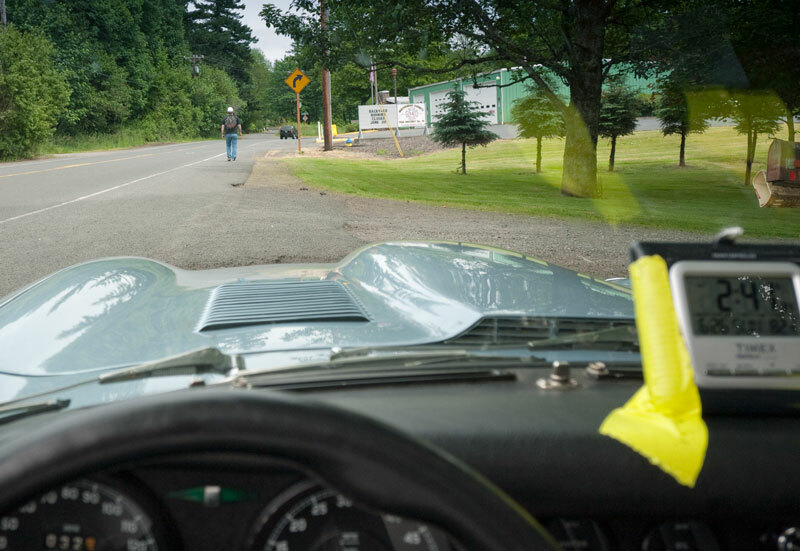 Unburdened by timekeeping, we follow the route directions at whatever speed we wish, and roll into the finish area at a state park near Troutdale, Oregon. The post-Rally refreshments are limited to water, or beer, which I find frustrating as we’ve got a 3 hour drive to get back to Central Oregon. We actually leave for a bit, to meet Kyle’s wife at a gas station nearby. I’ll gas up the Jag, and Kyle will drive his car back to Prineville. 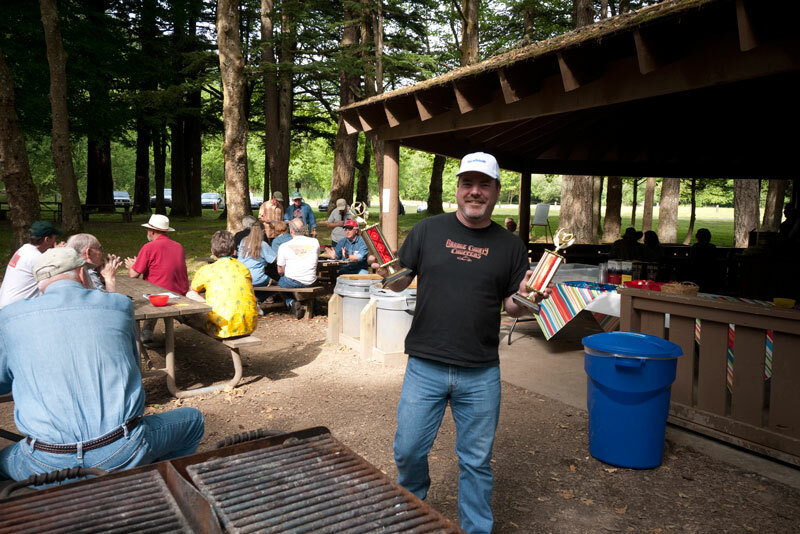 We stop by the state park in Troutdale in time to hear the rally results, and sure enough we collect a trophy. Reid mailed me the full rally results a week or so later and I note that without MY screwups, Kyle would have easily navigated us to a second-place finish in Novice class, and a likely ~10th overall. As it stands we finished 16th overall and 3rd in Novice. Not a bad outing. Hopefully we’ll be back next year.